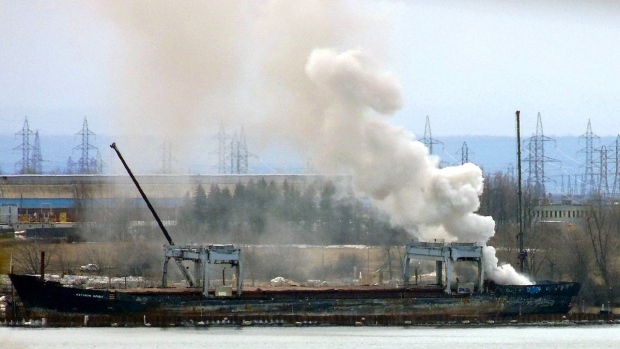 Fire broke out Tuesday morning in an abandoned cargo ship being dismantled in Beauharnois. The Kathryn Spirit, which has been docked on the St. Lawrence River since 2011, caught fire mid-morning on Tuesday, creating a plume of smoke that was visible from kilometres away. Firefighters from Beauharnois and Chateauguay were called to put out the fire, while officials from the Public Safety Ministry were also on hand. Work to tear apart the ship began in January. 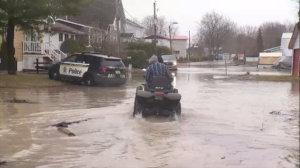 The Beauharnois fire chief told CTV News that all flammable liquids were removed long ago, but that some liquids had been absorbed by materials such as insulation. They suspect a spark from cutting tools ignited some of those soaked materials in the ship's engine room, but that workers on the vessel managed to get out safely. Several hours after the fire broke out it was still too hot for firefighters to approach the room where the fire was burning, but crews were preparing to pump foam into the room and extinguish the flames. Water proved ineffective against the flames, and teams of firefighters turned to the foam to finally get the blaze under control by 2 p.m. Experts from Environment Canada and Environment Quebec were on site to collect and analyze air samples as a precautionary measure. No nearby residences needed to be evacuated, because they are seasonal homes and were not occupied at the time.